Over the last couple weeks you’ve been hearing me talk about the an online event that I’m creating that will help you learn to scale your business from the top ecommerce sellers in our industry. Good news! The time has come when I can share the details with you… and since you’re on my email list I wanted to let you to be the first to know! Many Amazon sellers and e-commerce entrepreneurs are one-man or one-woman shows. They may be working alone in their basement on their online businesses and struggle to surround themselves with like-minded, successful entrepreneurs to help them learn, grow, and scale their businesses. I should know because I’m one of them! So I decided to invite some of the most successful, sharpest, and proven 7 Figure Sellers to teach you the secrets of their success. I’m very grateful to have very successful entrepreneurs including Greg Mercer, Mike Jackness, Chad Rubin, Bernie Thompson, Sophie Howard, Chris Rawlings, KJ Robinson, Andy Humphrey, Eddie Levine, Dave Bryant, Chris Davey, Sean Smith, Taylor Benterud, Jordan Linberg, Elaine Pofeldt, John Di Giacomo, Jared Haw, and many others come speak. Don’t miss out on this amazing online event (and it’s free for a limited time)! We have an amazing lineup of speakers and this event is for YOU the e-commerce seller. I guarantee that you will learn and get tremendous value in learning to scale your business to 7 Figures from these real entrepreneurs who are hustling and persevering day in and day out. 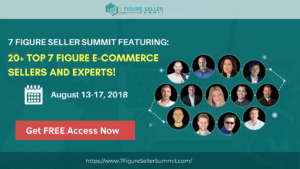 I admit that I have been less active recently and it’s because I’ve been working so hard on this summit for months so I could find the right people to feature and create the best online summit for e-commerce and Amazon sellers.